The worst-kept secret in the NFL is now out in the open as Jon Gruden will be introduced as the next head coach of the Oakland Raiders during a press conference on Tuesday, a move that caught the attention of Golden State Warriors head coach Steve Kerr. Gruden has reportedly agreed to a 10-year, $100 million contract, the largest for a coach in NFL history. On Friday, Kerr, a fellow Oakland coach, was a guest on "The Damon Bruce Show" on 95.7 The Game in San Francisco. He had a great reaction when he was asked about Gruden's new contract and was quick to mention that he had already discussed the deal with his own general manager, Bob Myers. "I’m actually thrilled (about it) because Bob Myers and I had a conversation this morning and I said, 'You know, Bob, Gruden’s got one title and I’ve got two,' Kerr said, a reference to the Warriors' two NBA championships compared to Gruden's one Super Bowl win with the Tampa Bay Buccaneers. "And a hundred mil over 10 years? I don’t know. Maybe we need to talk, Bob." 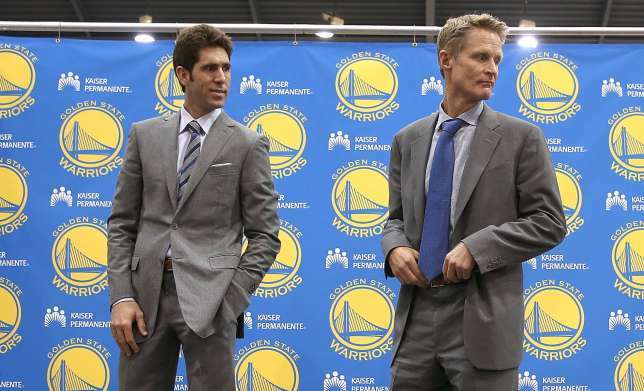 Kerr laughed about the conversation, but most good jokes have a certain level of truth to them. 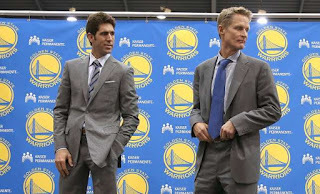 Kerr is currently in the fourth year of a 5-year, $25 million contract with an annual salary of $5 million. But considering there is no salary cap for coaches and players are routinely signing deals worth $20 million per year or more in all leagues, it does seem that Kerr might be underpaid. Of course, the Warriors won't want a lame-duck coach next season and Kerr has a good chance to add a third title before Gruden even coaches another game with the Raiders. In other words, Kerr will have plenty to talk about with Myers this offseason.